Interview: Do you ever feel stuck with entrepreneurial self-doubt? I don’t know about you, but I have certainly had my moments of entrepreneurial self-doubt (and more!) on my business journey. The worst case was deleting the manuscript for Dare To Dream Bigger, the night before it was due to go to the printer, because I was scared. That was despite my R&D team telling me they loved it! I have had all of these t-shirts. And I have created ways to handle them – without sticky plasters or grit determination or ‘feel the fear and do it anyway’. That’s why I wrote Dare To Dream Bigger. 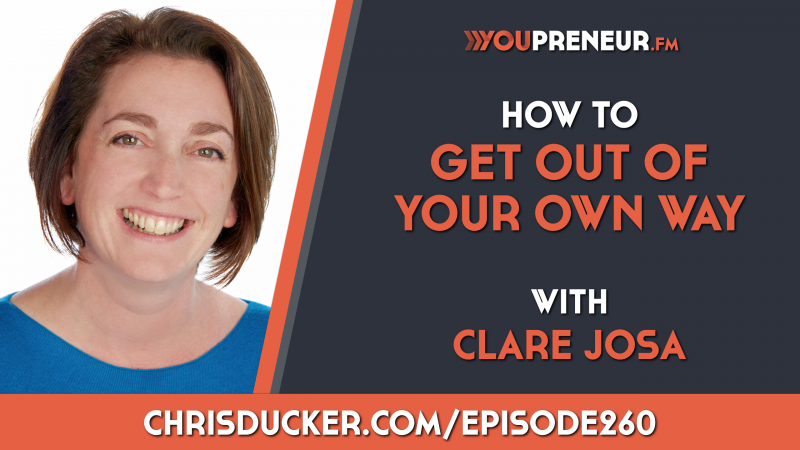 And it’s why, when I met Chris Ducker at his Youpreneur Summit in November and gave him a copy of the book, he invited me to be on his podcast to talk about how to handle entrepreneurial self-doubt. It’s such a big – and little talked-about – issue. His Youpreneur podcast was recently voted one of the top five podcasts for entrepreneurs in the world (big congrats Chris! ), so it shows you how important he feels it is to get entrepreneurial self-doubt out in the open – and dealt with! How has self-doubt affected your entrepreneurial journey? Which aspects of this interview resonated with you? And what action are you going to take – in the next 24 hours – to handle this? If you’re not a member of my 5Minute.biz VIP yet (no charge! ), you’ll need to register free here, first: https://www.5minute.biz/5-minute-biz-vip-join-us-free/ to get an email with your login details, then you’ll be able to read the forum thread, above. The email takes about five minutes to arrive! P.S. The Passionate World Changer Club goes live on Wednesday 31st January at 11am!